A very quick and easy clean dinner. We love this in our house – it’s a staple after work quick meal. Jam packed with flavour, use lean mince to keep the fat content down and the protein content up. The cucumber salad is a light and lovely plate to have in the evening too, fill up on that and there’s no need for any carbs. Use a spiraliser or shave the cucumber with a peeler to make nice long thin pieces; I feel like creating a salad bowl this way tastes fresher, cleaner and better than a bowl of chopped up pieces. Isn’t that what they say on Masterchef? It’s all in the presentation? 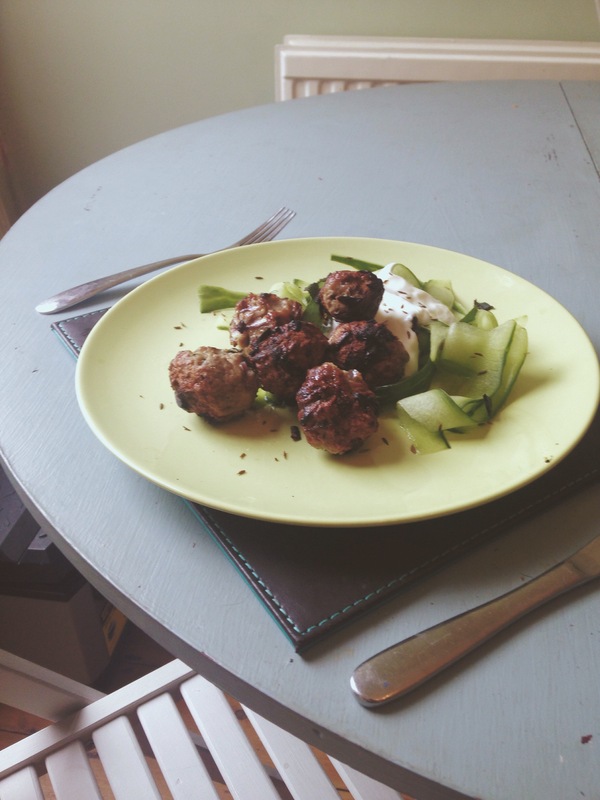 Lay cucumber, onion, yoghurt and mint onto a plate. Drizzle lemon over. The last part is key.